Due to an eye ailment, Walter “Monk” Dubiel was not considered healthy enough to serve in WWII and with a sore hip and chronically aching back, there were times he was just barely healthy enough to pitch for the Yankees. New York signed this native of Hartford, Connecticut in 1941 and he spent the next four seasons moving up the organization’s farm system. 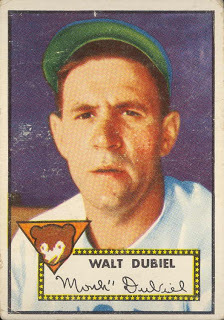 By 1944, most of the front-line big league pitchers were in the military and Dubiel, who had gone 16-9 for the Yankees’ double A affiliate in Newark the year before, was ready to make his debut in the Bronx. The six foot tall right-hander went 13-13 in his rookie year, threw three shutouts and posted a very respectable ERA of 3.38. But he also pitched 232 innings for Manager Joe McCarthy’s third place ball club, which was fifty more than he had ever pitched in a single season in the minors. He couldn’t match that workload in his sophomore season in pinstripes and his ERA in 1945 climbed to 4.64, but he did manage to post a 10-9 record, which would turn out to be his only winning season as a big league pitcher. Since the war had ended, all of the Yankee pitchers who had served in the armed forces returned en-masse to New York’s 1946 spring training camp. Dubiel couldn’t make the cut and he was sent back to Newark by McCarthy. Accompanying him to the minor league club that spring was a short stumpy Yankee catcher by the name of Lawrence Berra. Yogi would end up back in pinstripes one day but Monk never did. In 1947, he became the property of the pitching poor Philadelphia Phillies via the Rule 5 Draft, which eased his path back to the big leagues. He went 8-10 for Philadelphia in 1948, with 2 shutouts and 4 saves. That December he was traded to the Cubs. He would pitch the next three seasons and a tiny part of a fourth in the Windy City and then return to the minors for good. He ended his seven-year career as a Major League pitcher with a 45-53 record and an ERA of 3.87 with 11 saves and 9 shutouts. Dubiel shares his birthday with this former Yankee starting pitcher, this one-time Yankee utility infielder and this one-time New York first-baseman. One of the ramifications of the wild love/hate dynamic between Billy Martin and George Steinbrenner is that it actually may have destroyed some promising players’ careers. Take Dave Revering as an example. He had been a very good minor league player in the Reds’ organization at a time when the Big Red Machine was so stacked with talent it was difficult for prospects like Revering to make the parent club’s roster. As often happens in that situation, Cincinnati dealt their promising young first baseman to the A’s for Oakland reliever Doug Bair during the 1978 spring training season. Revering went from a spring training camp where he faced an almost certain return trip to the minors to another one where he was almost certain to be added to a big league roster. The then 25-year-old Roseville, California native proved he was more than ready for the big leagues when in his 1978 rookie season he hit .271 with 141 base hits and 16 home runs. The big left-handed hitter did even better in his second season, hitting 18 home runs, driving in 77 and raising his average to .288. Not too many people were paying attention to Revering because he was playing on some pretty awful Oakland teams. 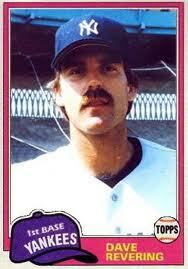 In 1980, Revering finished with a higher batting average (.290) for the third consecutive year. More significantly, the A’s had hired Martin to manage the team that season and the former Yankee skipper led them to a much-improved second-place finish in the AL Western Division. Martin was a big fan of surrounding himself with players who he trusted, not just on the field but off of it as well. First baseman Jim Spencer was one of those guys. So when Revering got off to a slow start during the 1981 season, the A’s were able to swing a deal with the Yankees to swap Revering and a couple of young pitching prospects for Spencer and pitcher Tom Underwood. The mid-May timing of the transaction couldn’t have been worse because just three weeks later the season was halted by a players’ strike. When it was over, a split season format was instituted which, if you were old enough to remember it, turned that year’s regular season into an embarrassing circus. Revering immediately took over the left-handed component of the Yankees’ first-base platoon duo (with Bob Watson the right handed piece) and got off to a slow start. Just as he got into a groove, the strike commenced. When play resumed, Revering struggled again to find his swing and finished his first season in pinstripes with a .235 average, the lowest of his career. Though the Yankees kept him on their postseason roster through the crazy split-season AL playoff series, they left him off their World Series roster that year. Revering’s hitting struggles continued in spades at the beginning of the 1982 regular season. It was evident he was having a crisis of confidence at the plate. Of course, he wouldn’t be given much of a chance to work through it on that Yankee team. In early May, he was part of a three player package dealt to the Blue Jays for the veteran John Mayberry. Mayberry was of course over the hill at the time and would do little as a Yankee. The Revering that left New York in no way resembled the confident young hitter he had proven to be in Oakland. Revering shares his February 12th birthday with this one-time Yankee utility infielder, this former Yankee starting pitcher and this one too. 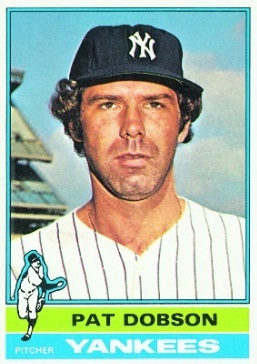 Former Yankee starting pitcher, Pat Dobson was born in Buffalo, NY in 1942. In 1974, Dobson and fellow starter, Doc Medich, each won 19 games for a rejuvenated Yankee team that finished just 2 games behind Baltimore for that year’s AL Eastern Division crown. I’ve always felt that if Mel Stottlemyre did not tear his rotator cuff that same season, that Yankee team, managed by Bill Virdon, would have won their division. If they had won in ’74, perhaps George Steinbrenner would not have brought in Billy Martin to replace Virdon the following year. Martin did not like Dobson and told the Yankee GM, Gabe Paul to get rid of him. 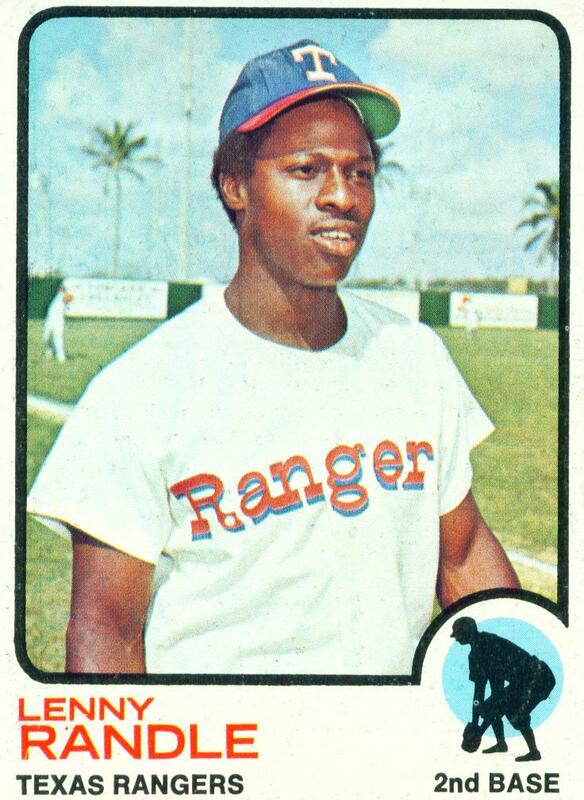 Paul obliged by trading the right hander to Cleveland for Oscar Gamble. Dobson’s best year in the big’s had been 1971, when he was one of four Oriole starters to win 20 games in a season, only the second time this had been accomplished in Major League Baseball. Jim Palmer, Dave McNally and Mike Cuellar were the other three Baltimore pitchers involved. Dobson was known for his curveball and during his 11-year pro career he won 122 games while losing 129. When his pitching days were over he became a pitching coach, then a scout and finally a front office executive with the San Francisco Giants. He died in 2006, a victim of leukemia, when he was just 64-years-old. Dobson shares his February 12th birthday with this one time Yankee first baseman, this former utility infielder and this WWII era Yankee pitcher.